The C3PO extended human presence in space by enabling an expanding and robust U.S. commercial space transportation industry. C3PO is responsible for managing NASA's Commercial Orbital Transportation Services (COTS) projects. The Commercial Spaceflight theme encompasses completion of commercial cargo capability milestones and will expand NASA's efforts to develop commercial crew capability to LEO and the ISS. NASA’s Commercial Crew Program (CCP) is an innovative partnership to help the United States industry develop space transportation systems that can safely launch astronauts to the International Space Station (ISS) and other low Earth orbit destinations. A human outpost in space bringing nations together for the benefit of life on Earth and beyond. NASA's Commercial Crew and Cargo Program is investing financial and technical resources to stimulate efforts within the private sector to develop and demonstrate safe, reliable, and cost-effective space transportation capabilities. The Program manages Commercial Orbital Transportation Services (COTS) partnership agreements with U.S. industry totaling $800M for commercial cargo transportation demonstrations. 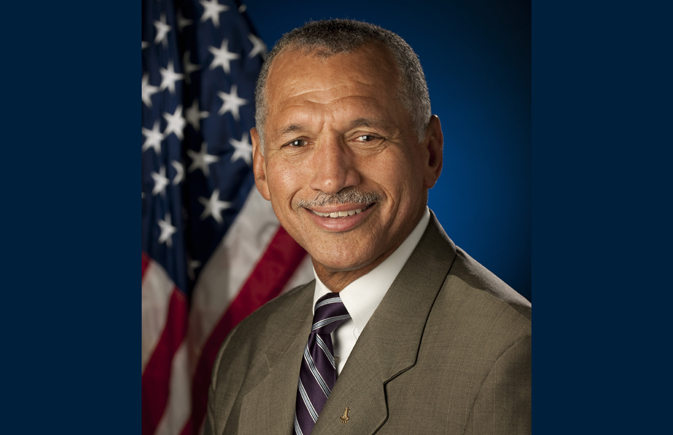 The Program also invested $50M in initial commercial crew development activities. NASA Administrator hailed the success of the agency’s public-private partnership with American companies to resupply the ISS & announced the next phase of contracting with U.S. companies to transport astronauts is set to begin next week. 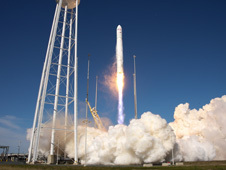 Orbital Sciences Corporation, one of the world’s leading space technology companies, confirmed that its Cygnus cargo logistics spacecraft reentered Earth’s atmosphere. Cygnus unberthed from the ISS following its 23-day stay. 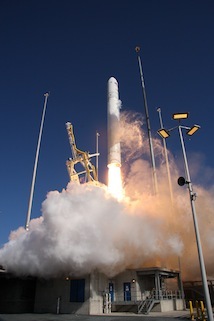 NASA Television will air pre- and post-launch news conferences and provide live launch coverage of Orbital Sciences Corporation's cargo resupply demonstration mission to the International Space Station. NASA officials released a synopsis requesting information from U.S. private enterprises interested in pursuing unfunded partnerships. Orbital Sciences announced it is now targeting a mid-September launch window for its demonstration flight to the International Space Station. NASA COTS partner Orbital Sciences Corporation successfully launched its Antares rocket April 21, 2013 on its maiden flight. The Antares test flight vehicle was successfully rolled out to the Mid-Atlantic Regional Spaceport Pad-0A at NASA’s Wallops Flight Facility on Saturday, April 6. Orbital Sciences successfully conducted an engine test of its Antares rocket at the nation's newest launch pad. The first contracted SpaceX resupply mission has berthed to the International Space Station. SpaceX aims to change the space paradigm by developing a family of launch vehicles which will ultimately reduce the cost and increase the reliability of space access by a factor of ten. Founded in 1982, the company has pioneered new classes of rockets, satellites and other space-based technologies that help make the benefits of space more affordable, accessible and useful to millions of people on Earth.